Maj. Gen. Lee Tafanelli is the adjutant general of Kansas. He was sworn in as adjutant general on Jan. 28, 2011, and promoted to major general in the Kansas National Guard. He received federal recognition Sept. 22, 2012. As the adjutant general, Tafanelli oversees the activities of the Adjutant General’s Department. This includes providing command and control for more than 7,700 soldiers and airmen in the Kansas Army and Air National Guard. As the director of Kansas Emergency Management, a division of the department, he guides a professional core of personnel that prepare for, respond to and mitigate disasters. In addition to the part-time soldiers and airmen, the department he leads includes about 2,300 full-time state and federal employees. Additionally, 105 county emergency managers and their staffs receive guidance and training through the department. Tafanelli is also the director of Homeland Security for Kansas, where he works to ensure security in the state is a top priority. 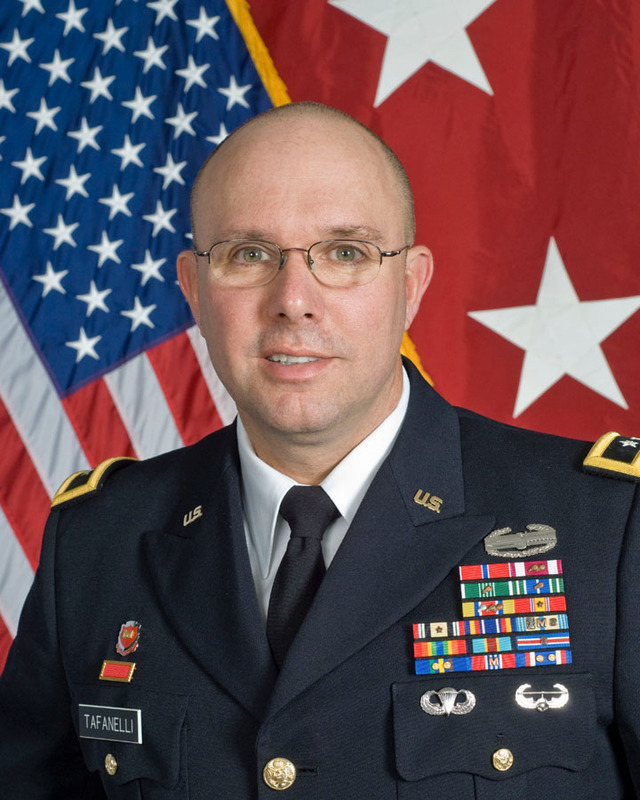 Prior to his appointment as adjutant general, Tafanelli assumed the position of assistant adjutant general - Army, Kansas Army National Guard, and commander of the Land Component for the Joint Force Headquarters-Kansas on July 19, 2010. Tafanelli joined the Kansas Army National Guard in 1980 and was commissioned as a second lieutenant in the Corps of Engineers through Pittsburg State University’s ROTC program in 1982. Tafanelli has served in a wide variety of command and staff positions as a traditional Guardsman, Active Guard and Reserve and Active Duty soldier at the company, battalion, brigade, state headquarters and Department of the Army level. His battalion and brigade level assignments include reconnaissance officer; equipment platoon leader; supply officer; company commander; and training officer in the 891st Engineer Battalion. He also served as the personnel officer and training officer of the 69th Infantry Brigade, 35th Infantry Division. In 2005, as commander of the 891st Engineer Battalion, he led the battalion during a deployment to Iraq for Operation Iraqi Freedom. He later served as commander of 69th Troop Command and as director of operations for the Kansas National Guard. Tafanelli served as the executive assistant to the Adjutant General of Kansas, State Recruiting and Retention manager, mobilization planner; Force Integration and Readiness officer; Education Services officer; and Surface Maintenance Manager at state headquarters. At the Department of the Army level, he served as military assistant to the assistant secretary of the Army for Manpower and Reserve Affairs at the Pentagon in support of Operations Noble Eagle and Enduring Freedom. In 1999, Tafanelli received a master’s degree in Environmental Planning and Management from Kansas State University. He is a graduate of the Engineer Officer Basic and Advanced Courses, U.S. Army Command and General Staff Officer Course, Army Force Development and Modernization Course, Army Mobilization and Deployment Course and the Air Command and Staff Officer Course. He is also a graduate of the Army's Airborne and Air Assault Courses.